On a recent beach trip, we found it entirely necessary to invent a sparkling cocktail to sip on our ocean front balcony. Working with the ingredients from our box of booze lugged from home, we conjured a cocktail worthy of commentary. We proudly present the Sandpiper (drink named for the condo, condo named for a beach bird). One part St-Germain, 2 parts Lillet Rosé, 3 parts sparkling wine (your choice but I would go brut or drier). St-Germain is a liqueur that is made in France from handpicked elderflowers that grow in the Alps. Elderflowers grow during a 4-6 week period in the spring and fresh flowers are picked and macerated daily. Because St-Germain only uses fresh picked, not dried, flowers speed and timing are of the essence. Imagine small farmers hand picking their floral harvest and delivering them to small collection sites by bicycle. St-Germain has a secret maceration method (crush in a way to extract flavor) that yields flavor but not bitterness. I am pretty sure the secret involves fairies dancing on the petals with their little fairy feet. The result is a beautiful golden nectar that is sweet and viscous and tastes of elderflower (of course) plus peach, mango, apricot, ripe pear, other tropical fruits. The flavors are so complex it is hard to name them. Whatever you smell or taste in St- Germain, my answer would be, “Yes, absolutely”. St-Germain can be enjoyed alone chilled or in a cocktail, is 20% alcohol, and retails for ~$40. Lillet (lee yā) is a secret blend of wines from Bordeaux grapes (85%) and various fruit liqueurs (15%). It is made in the original site in Podensac in the Bordeaux region of France. There are three styles rouge (red – with a large portion from Merlot), blanc (white with a large portion from Semillon and some Sauvignon Blanc) and rosé (also a combination of Bordeaux grapes with less skin contact). The rosé Lillet nose and palate remind me of a baked orange sweet roll (orange blossom, peach, and marzipan). 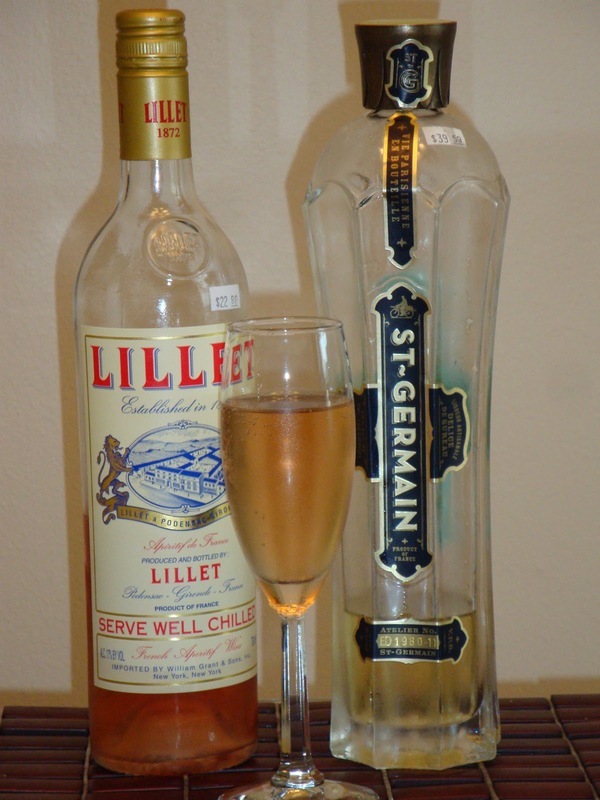 Lillet is an aperitif (a before dinner drink). It is to be served chilled or with ice and can be mixed into a cocktail or enjoyed alone with a hint of citrus -slice or zest. The rosé is 17% alcohol, and retails for ~$23. Both St-Germain and Lillet can be stored in the fridge after opening for up to a month. Creative cocktail and partial blog contribution courtesy of Mark Helm.